Healthcare in the frontier was an imperfect science in the mid-19th century, and mortality rates were lamentably high. Many children arrived at the end of the trail with fewer parents or siblings than they left home with. The number one killer on the trails, by a wide margin, was disease and serious illnesses, which caused the deaths of nine out of ten pioneers. The hardships of weather, limited diet, and exhaustion made travelers very vulnerable to infectious diseases such as cholera, flu, dysentery, measles, mumps, tuberculosis, and typhoid fever which could spread quickly through an entire wagon camp. Many of pioneers who headed west in the 19th Century hoped to leave behind the disease and contamination of the Eastern cities. They expected to find an environment of clean air and water, however, it was these very emigrants that instead, changed the environment of the West, bringing with them bacteria and viruses. These epidemics wrought turmoil along the overland trails, affecting both pioneers and Indians. The worst disease on the Oregon–California Trail was Cholera. Along the trails, opportunities for sanitation — bathing and laundering — were severely limited, and safe drinking water frequently was not available in sufficient quantities. Human and animal waste, garbage, and animal carcasses were often in close proximity to available water supplies. As a result, cholera, known as the “unseen destroyer” spread by contaminated water, was responsible for the most deaths on the overland trails to California and Oregon. Symptoms started with a stomach ache that grew to intense pain within minutes. The disease progressed rapidly, attacking the intestinal lining, producing severe diarrhea, vomiting, abdominal pain, and cramps. Within hours the skin was wrinkling and turning blue. With no cure or treatment for the disease, the infected emigrant usually died within 24 hours or less. Cholera was thought to have begun in India and quickly spread around the world along trade routes. It first appeared in America in 1832 and by the next year, it had made its way to St. Louis, Missouri from New Orleans, Louisiana via the Mississippi River. It then made its way westward along the riverboats along the Missouri River. St. Louis, Missouri was struck by the epidemic in early 1849 and by the end of summer, estimates of dead ranged from 4,500 to 6,000. 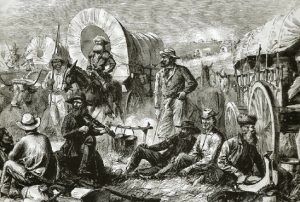 During the 1849 California Gold Rush, travelers carried the bacteria along the Santa Fe Trail and other overland routes. The epidemic thrived in the unsanitary conditions along the trails, peaking in 1850 as it was stoked by the immense numbers of pioneers on the overland trails in 1849 and ’50 seeking their fortunes. The number of trail deaths is difficult to determine, however, there are estimates as high as 5,000 in 1849 alone. 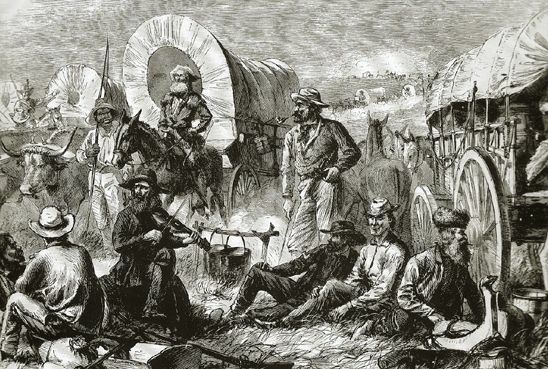 The losses in 1850 were even greater prompting one Missouri newspaper to estimate that along a stretch of the Overland Trail, one person per mile died from the disease. Thousands of travelers on the combined California, Oregon, and Mormon Trails succumbed to cholera between the years of 1849 and 1855. Most were buried in unmarked graves in Kansas, Nebraska, and Wyoming. Although also considered part of the Mormon Trail, the grave of Rebecca Winters is one of the few marked ones left. The disease was particularly deadly at the frontier outposts. In the summer of 1855, cholera struck Fort Riley, Kansas killing the commanding officer, Major E. A. Ogden, along with about 70 other people. Along the Platte River in Nebraska and Wyoming was the site of the highest infection rate during these years. Because of the Platte’s brackish water, the preferred camping spots were along one of the many freshwater streams draining into the Platte. With hundred utilizing the streams for bathing and drinking water, the streams became cholera breeding grounds. The dead lay sometimes in rows of fifty or more. Fortunately, once the emigrants were past Fort Laramie, Wyoming they were largely safe from cholera at the higher elevations. 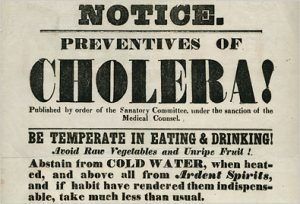 “People were continually hurrying past us in their desperate haste to escape the dreadful epidemic.” – Ezra Meeker, speaking of cholera on the trail, 1852. Nomadic Indian tribes also suffered the same conditions as the western bound pioneers. As many as one-half of the Pawnee and two-thirds of the Southern Cheyenne died of cholera between 1849 and 1852. Reports among the Comanche state that survivors lacked the strength to bury their hundreds of dead while Arapaho legends tell of several people who committed suicide rather than face the dreaded sickness. At the time of these outbreaks, the best treatment for cholera infections were unknown. Medical practitioners could do little to treat the pioneers except for prescribing camphor and laudanum, which could relieve the pain but did nothing to cure the disease.